WJI — Day 11: Super legit. It’s hard to believe six months two weeks have already passed! But they have, and I’m grateful that they happened. I’ve learned a lot from this course — and it’s possible that I learned the most in one sitting today than I learned in any other singular class. 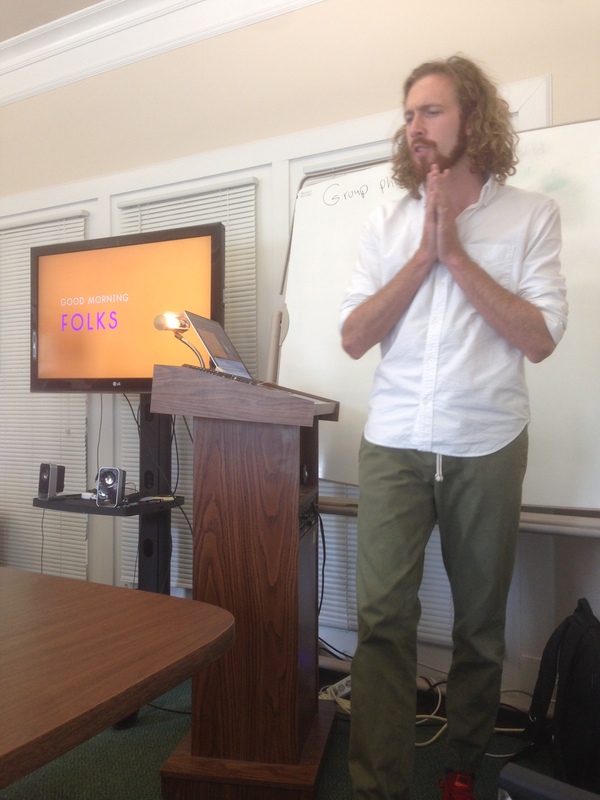 Drew Belz, one of the founders of fancyrhino — even their website is incredible — was our main instructor today. He was legit. His equipment was legit. Everything about today was legit. After the essential philosophy in the beginning of his presentation, he got into the real nitty gritty stuff. We learned a ton about how to create a story arc. That was really important because even though I took a Media Production class last semester — and I attended ALL the classes — the philosophy went over our heads and the technical instruction was very meticulous. The idea of a story has a few elements that are really necessary to nail down. 1. A story should have an anecdote. Thomas Miller and I went out to shoot a short video with AJ Pyatt, a local street musician I wrote about before. For our anecdote portion, AJ told us all about his best show, which turned out to be his most embarrassing show — when he broke a string, he tossed his guitar to his buddy offstage. He forgot that it was plugged into the sound system, so it hit the ground. While embarrassed, AJ told us that the crowd laughed, loosened up, and started to actually engage with him. 3, A story should have a “but” and a “therefore.” In spite of setbacks and in spite of embarrassing moments, AJ exudes expectation and happiness. It’s because of the way he chose to overcome parts of his situation that he is the person he is. Much respect, AJ.